Carlisle United have signed Queens Park Rangers defender Gary Borrowdale on a one-month loan deal. The 25-year-old former Coventry and Crystal Palace man has made three appearances for Rangers this season. 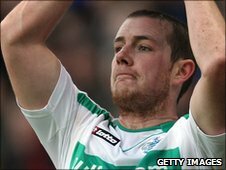 Carlisle manager Greg Abbott told the club website: "He is a player who needs football and he jumped at the chance of coming here. "He's a good one to add to the mix, he is experienced, ready to go and we are looking forward to working with him." Borrowdale is available Tuesday's Johnstone's Paint Trophy northern area final against Huddersfield Town. The Cumbrians, who were beaten finalists last season, lead 4-0 after the first leg.